Russian President Vladimir Putin, 2018. 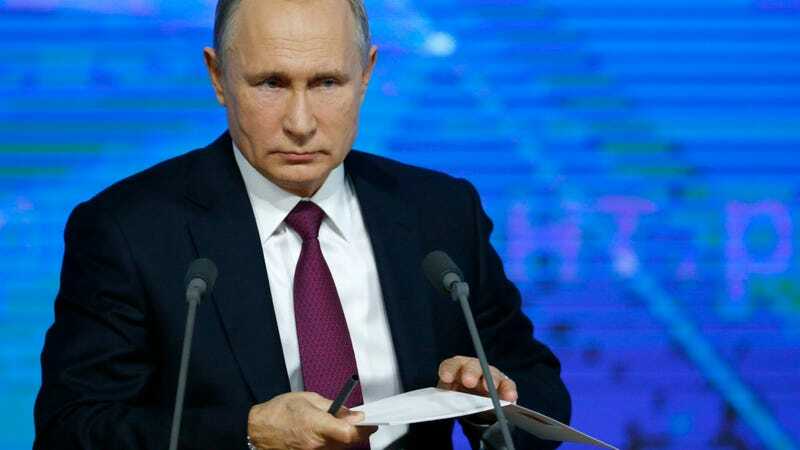 Russia announced on Saturday that it is also suspending the 1987 Intermediate-Range Nuclear Forces Treaty (INF) following a U.S. decision to pull out of the agreement, upping the odds that the treaty will collapse entirely. Earlier this week, Secretary of State Mike Pompeo announced that the U.S. would be suspending the treaty, which prohibits both the U.S. and Russia from manufacturing ground-based missiles with a range of between around 310 and 3,100 miles. According to Donald Trump’s administration, Russia failed to destroy (and verify it had destroyed) certain new weapons systems that were in violation of the INF within a 60-day deadline, though six months will pass before the INF would be terminated entirely. The development of a ground-based Kalibr system would, of course, be a direct violation of the treaty, making it much more unlikely that the U.S. and Russia can reach an agreement to restore the INF within six months. However, as the BBC noted, the official U.S. rationale for suspending the INF is the existing Novator 9M729, which the government believes is very similar to the Kalibr and capable of hitting targets within the banned ranges. A new arms race would be a dark era for people who don’t want to get nuked. The original agreement, which came after the Soviets deployed SS-20 missiles and the U.S. responded by parking Pershing and cruise missiles throughout Europe, resulted in the destruction of thousands of missiles. “We are heading into a direction we have not been in in 40 years: no arms control limits or rules that we are both following, and that is very dangerous,” Nuclear Threat Initiative vice president and former National Security Council arms control and non-proliferation official Lynn Rusten told CNN. Russian military officials have stated that if the current situation escalates into a shooting war—a possibility that, for now, remains distant—their prime targets for retaliation will not be the U.S. but allied countries where previously INF-banned missile systems are based. While many experts agree that Russia is likely in violation of the agreement, there is considerable concern that the U.S. is being goaded into taking the blame for its potential collapse instead of trying to salvage it. Speculation has also been rife that the Trump administration is eager to find a rationale to terminate the INF so it can develop short- and medium-range missiles to compete against China. China is not a party to the INF, and the U.S. intelligence community warned in a recent report to Congress that the nation is increasingly allied with Russia. According to the New York Times, China has comparatively much more modest nuclear capabilities than either the U.S. or Russia, “but Beijing has been upgrading and expanding its arsenal.” A Pentagon report last year said China likely has 16-30 intermediate-range missiles, the paper added. “If Russia’s doing it and if China’s doing it, and we’re adhering to the agreement, that’s unacceptable,” Trump said in October 2018.